There was Howard Davis Jr. recently at ringside at Foxwoods MGM Theatre in Connecticut watching his son Dyah Ali, throw some combinations at his opponent. He would observe and meet Dyah after the eight-round unanimous decision. Darnell Boone, 19-7, gave his opponent a tougher fight than expected on the undercard of promoter Lou DiBella. “He has to step it up,” said Davis the 1976 United States Olympic Gold Medalist. Davis would know about giving that little extra, even though Dyah improved to 22-1, ranked in the top 10 among the elite supper middleweights. 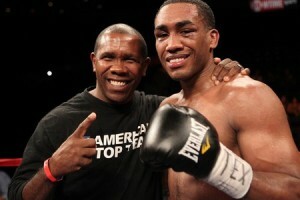 This has become a part of the latest father and son team in boxing. And it keeps Davis busy in between his promotional responsibilities as a promoter of boxing and MMA events down in south Florida. Dyah had a rough time throwing combinations and going to the body. Part of the difficulty has been inactivity, something that Davis attributes to DiBella not giving his son enough opportunity. “Our third fight with him and we are not happy,” said Davis. The promotional deal with DiBella called for Dyah to be fighting more often. That hasn’t occurred and Davis is more concerned now that his son will have to go back to the drawing board. He was coming off a tough 10-round unanimous decision, in April over Marcus Johnson despite putting his opponent down twice in the ninth round. “Due to my inactivity,” he said. “I could have been a little stronger.” There was no question this was not the fight fans of the 30-year old Dyah came to see. Davis took an afternoon flight from Coconut Creek Florida and took some time from his responsibilities coordinating MMA fights and boxing shows for Fight Time Promotions. Davis is a part of boxing history. He won the Val Barker Award at the Olympics as the most outstanding fighter over Sugar Ray Leonard, Leon and Michael Spinks. The professional career included stints as a lightweight, junior welterweight, and finally hung up the gloves as a middleweight after a loss. The Glen Cove New York native, a suburb of New York City, never forgets his roots and his popularity remains in his hometown. But now the emphasis is on MMA, pro boxing, and of course assuring that his son does not become a part of boxing politics. He says MMA is surpassing boxing because the sport has a younger demographic and he trains many fighters that go in the cage including Chuck Liddell. “There is a progression to do more,” he says about promoting four shows a month in south Florida. There is a concern about his son, not when it comes to the ability that Dyah can move on and become a champion like his father. They have been testing the promotions and went to DiBella feeling comfortable about their situation. Dyah is a natural at 168 and there has been a discussion regarding a move to 175. About moving up in weight, says Dyah, “It is in my future. Dad is my best friend. Things that happened in the ring with him, he tells me. I listen. It is always good coming from him.” And it is important to understand that Dyah called his father about a boxing career and had no amateur fights. It was a late start into the world of pugilism after watching the Klitschko brothers and Lennox Lewis on HBO. He worked at reducing his weight, something that is a factor that will not become an issue if he decides to move up in weight. “I want to do what my father did and for myself,” he says. DiBella, with Diamond Belt Middleweight champion Sergio Martinez, middleweight Andre Berto and promoting more shows at casino resorts, including Connecticut and Atlantic City, said it is a slow process for Dyah. But there are plans to have Dyah continue on a path to stardom. “He is showing a lot of good instincts and it is up to him as to where he is more comfortable fighting at 168 or 175,” said DiBella. But Davis said he would be looking at more options. “He has nothing to lose, every fight is a lesson,” he says, reiterating that his son had no amateur fights. It is back to the drawing board and Davis would not comment more about a future with DiBella as it relates to the progression of his son. It was a brief meeting with the family and back on a plane to Florida. Dyah would get some needed rest and stay in contact with his dad. They see each other often in the proximity of Coconut Creek. “I have enough experience to let people know that I am here,” says Dyah. And with an Olympic champion offering advice, it can happen.